Andrea is responsible for all internal communications, external corporate communications, executive communications support, and consumer education program for Brazil and other Southern Cone countries in Latin America and Caribbean region. Andrea brings more than 15 years of experience in handling communications for national and international companies, as well as a background as political and economic editor for a Brazilian publication. 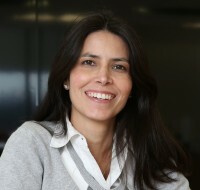 Before joining MasterCard, she worked for Unibanco (acquired by Itaú), as sales and internal communication specialist, Telefonica and Primeira Leitura website and magazine. Andrea has a Degree in Social Communication from the University of São Paulo, and a Pos Graduation certificate in Marketing Administration from Escola Superior de Propaganda e Marketing (ESPM), both in São Paulo, Brazil. She is fluent in Portuguese, her native language, English and Spanish. She also speaks French as the result of one year living in Montreal, Canada.